I will post my review here shortly but until then here is a bit of the The Observer's Tim Adams review, published on Sunday 6 October 2013. "Malcolm Gladwell has long traded in paradox. The paradoxes of his two previous bestselling theses – Blink and Outliers – included the fact that they almost exactly contradicted each other: one was a hymn to the power of instinctive thought; the other a paean to the overwhelming importance of long and dedicated study. What they shared was the author's lucrative obsession with the counterintuitive. Gladwell is most attracted to stories in which individual insight (either from a painstaking outlier, or a eureka-moment blinker) overturns received wisdom – stories which generally have the useful subtext of burnishing his own reputation for intellectual surprise, for pulling the zeitgeist out of the hat. It was, in this sense, probably only a matter of time before Gladwell turned his attention to the David and Goliath legend. Of course, all these Sunday school years, we have collectively been reading the giant-killing myth with the wrong emphasis. The story of the Israelite shepherd and the Philistine warrior is not, for Gladwell, primarily a tale of faith-based triumph against overwhelming odds, but rather a neat demonstration of shifting paradigms. Goliath in his clunking armour and spear was not so much an indomitable opponent, but a man hopelessly weighed down by old-fashioned thinking. He was never going to be a match for the modern "slinger", David, with his improvised weaponry and his refusal of convention. What counts most in the conflict is not the relative strength of opponents, but the rules under which they engage. 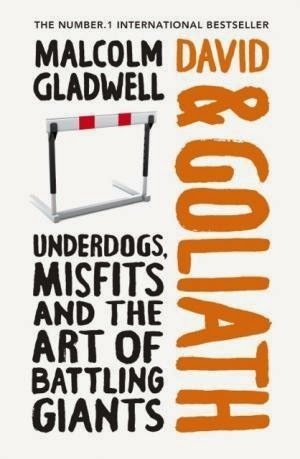 Davids have always and will always decapitate Goliaths, Gladwell suggests, because they represent the limber, quick thinking of progress in the face of the stolid, lumbering status quo. In one sense, David couldn't lose. That's the likable theory, anyway." Read more at The Observer's Tim Adams review, published on Sunday 6 October 2013.